[Angus Gratton] recently cracked open a pair of USB to Ethernet converters to see what’s inside. One was an Apple branded device, the other a no-name from eBay. The former rings in at $30, with the latter just $4. This type of comparison is one of our favorites. It’s especially interesting with Apple products as they are known for solid hardware choices and the knock-offs are equally infamous for shoddy imitations. From the outside both devices look about the same. The internal differences start right away with a whole-board metal shield on the Apple dongle and none on the off-brand. But the hardware inside is actually quite similar. There’s an RJ-45 jack on the left, followed by the Ethernet isolation chip next to it. From there we start to see differences. The off-brand had a blank chip where Apple’s ASIX AX88772ALF USB to Ethernet bridge controller is located. There is also a difference with the clock; Apple is using two crystals with the other using just one. [FozzTexx] had an old Atari 800 collecting dust and decided to pull it out and get to work. The problem is that it’s seen some rough storage conditions over the years including what appears to be moisture damage. He’s read about a cartridge called SALT II which can run automatic diagnostics. Getting your hands on that original hardware can be almost impossible, but if he had a flashable cartridge he could just download an image. So he bought the cheapest cartridge he could find and modified it to use an EPROM. When he cracked open his new purchase he was greeted with the what you see on the left. It’s a PCB with the edge connector and two 24-pin sockets. These are designed to take 4k ROMs. He dropped in an EPROM of the same size but the pin-out doesn’t match what the board layout had in mind. After following the traces he found that it is pretty much an exact match for an Intel 2764 chip. The one problem being that the chip has 28-pins, four too many for the footprint. The interesting thing is that the larger footprint (compared to the 2732) uses all the same pins, simply adding to the top and moving the power pins. A small amount of jumper wire soldering and [FozzTexx] is in business. When playing around with a cheap, handheld, dual-band radio, [Lior], a.k.a. [KK6BWA], found a schematic for a similar and even cheaper radio. He realized the programming pads were very accessible and the dev tools for the radio’s microcontroller were available from the manufacturer. After these discoveries, there really was only one thing to do: write new firmware for a $40 radio, and making a great tool for playing around in the 2 meter and 70 cm bands. The instructions for reflashing the firmware on this radio only require an Arduino and a handful of miscellaneous components. [Lior]’s new firmware for the uv3r radio isn’t quite finished yet, but he plans on adding some really impressive features. Things like a better UI for a four-button radio, a mode for tracking satellites, a digital mode, and a computer-controlled mode are all possible and on [Lior]’s project wishlist. Getting a $40 radio to do your bidding with an Arduino is cool enough, but [Lior] says this mod for the uv3r can be taken even further: if you’ve got an amateur radio license, it’s possible to use the uv3r to control an Arduino or other microcontroller from miles away. It’s a great hack, right up there with the USB TV tuner/software defined radio thing we saw almost exactly one year ago. You can check out a demo of some custom software running on the uv3r after the break. The radio listens for a DTMF tone (supplied by the uv3r’s big brother, the uv5r), and plays back a three-digit DTMF tone. There’s also a more through walk through of what [Lior]’s new radio can do as well. Finally upgrading our comment system. UPDATE: I’m working on making the visual style fit better. It really needs some work. Yes Ladies and Gentlemen, we’re finally taking the plunge into a more robust commenting system. This one has a ton of features, but the following few have been asked for quite frequently. You can now edit your comments. Yes, finally. No seriously, try it. To do this, you’ll need to log in though! Subscription to a comment thread is now optional. Horay! You can now “Like” or dislike comments. IntenseDebate is converting our old comments over, so they should begin to appear soon. Please feel free to email me directly[caleb@] with any issue you encounter using the new system. I know you’ve been asking for it for a very long time, I’ll do my best to make sure that it goes as smoothly as possible. Why toast your bread evenly when you can burn low-resolution images instead? Meet the Super Mega Mega Toaster, a University project created by [Scott van Haastrecht] for his Creative Technology course. Now you may be thinking that this has been done before. And indeed, a bit of searching will lead you to a post about toasting Jesus. 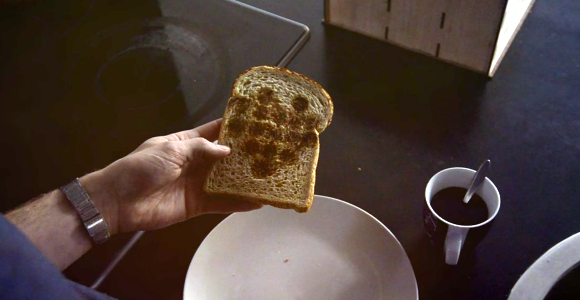 But that is a one-shot toaster hack which simply used a stencil to block heat to create a certain pattern. This is a mechanical overhaul for the toaster concept. It uses one row of six heating elements. Each is connected to a servo motor which moves the element next to the bread or away from it based on the pattering being printed. A stepper motor then moves the bread up so that the next row can be printed. All of this is mounted in a laser-cut wood frame which makes us just a bit nervous because the purpose of the elements is to burn stuff. See a demo of the toaster, as well as its internal components in the clip after the jump. The [Prutchi] family sounds pretty cool. [David], the father, is a well educated engineer, has 70 patents, and has written two books. On his off time, he has a passion for making experimental physics accessible to the average Joe. His daughter [Shanni] is a high school student who co-authored one of those same books, and helps conduct research in the fields of Radio-Astronomy and Quantum Physics. 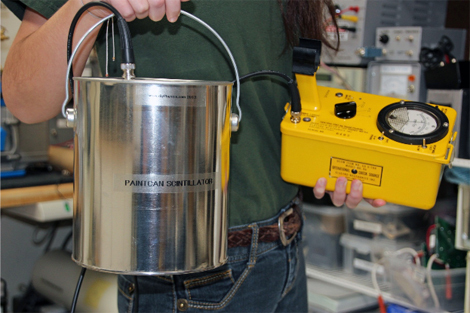 Together, they came up with an affordable, yet very sensitive, gamma-ray scintillation probe for their customized Civil Defense V-700 radiation survey meter. Sweet. They decided to use parts that were low cost and readily available so others could easily follow in their footsteps. A Philips XP5312/SN photomultiplier tube (PMT) and scintillation plastic are the main components. The enclosure for the probe is a standard paint can, lined with polyurethane foam inserts to help protect the assembly and hold everything in place. [David] says that since the probe is very portable and has a high level of sensitivity, it is an ideal candidate for radioactive mineral surveying and scouting miscellaneous gamma-ray sources. They documented the whole process and have compiled a handy PDF file for those who are interested in creating their own.